Helping others should not be viewed as political. It is good for the soul. When you help others, you forget about your own problems for awhile. In addition, nobody should make you feel bad about who you decide to help. 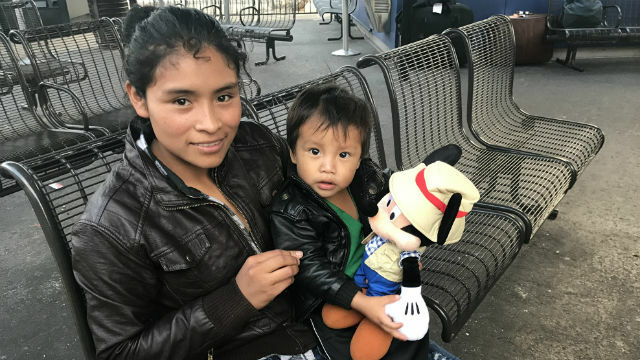 In July 2018, my friend Paula Sassi, and I started going to the bus station to help the families whom the Border Patrol was releasing from the detention centers. The adults and children were being sponsored by family members in other parts of the United States. The adults wore ankle bracelets as they had to check in when they reached their destination. Our plan was to help them on their bus journey, and The Bus Station Project was born. We made up bags of food, water, juice, and toiletries and took them to the bus station. We learned many things in the first month. We discovered that the best way to do this was to make up bags for one- to four-day trips, depending on what part of the country they were traveling to. We learned that fresh fruit was much appreciated, so we brought apples and especially, bananas. Paula didn’t like the way I made up the bags, so we began to define our roles. We both bought and collected donations [stored in my garage] and she put the bags together, while I was the driver, translator and spokesperson. One day we brought some stuffed animals for the children and they were such a big hit that we asked family and friends to donate stuffed animals to our cause. It struck a chord and many people responded. In fact, we have been very lucky in that so many friends and colleagues have donated to our project. We have also cultivated strong relationships with many of the employees at the bus station. They were suspicious at first, but once they saw what we were doing, they allowed us to move about freely. The employees are to be commended for their kind and giving hearts. Since this project started, we have helped families from Mexico, Guatemala, Honduras, El Salvador, Nicaragua and Venezuela. The majority have been from Central America. They arrive at the bus station exhausted, and many times hungry. One night four mothers and their children came and they were starving. We only had snacks in the bags, so we raced across the trolley tracks to a convenience store to buy them sandwiches. The owners were Iraqi immigrants and when they heard what we were doing, they threw in free corn dogs for the kids. The children are usually quiet and apprehensive, which is why the soft stuffed animals have helped tremendously and bring smiles to their faces. Most of the families arrive with their bus ticket in hand, but sometimes they have needed to borrow our phones to call their family members. One night a woman from Guatemala was there with her daughter. In this case, her husband was in North County, so she was waiting for him to pick her up. She was worried and hungry, so we gave her and her daughter some sandwiches and a stuffed animal. When her husband finally showed up, two hours later, tears of relief poured down her face. The situation is always fluid. We never know how many families are going to show up. At first it was no more than two to five families a day, but lately up to 15 or more families have shown up, which is beyond our capacity to help. Immigration and Customs Enforcement has been releasing many more families, mostly from Central America. This is why we are so grateful that other, much larger organizations have stepped in to help, providing food and even shelter if their bus leaves the next day. All the families have been so grateful to receive aid and human warmth. They can’t thank us enough. Paula is the daughter of Italian immigrants and was married to a Vietnamese immigrant. My grandparents arrived at Ellis Island and I was an English as a Second Language teacher for 35 years. We both know firsthand how much immigrants have contributed to this country. The Bus Station Project is like the little engine that could. We are small, but we are going to continue pushing forward and help as many families as we can. Mimi Pollack is a former English as a Second Language teacher and a freelance writer.